Fabricated from aluminum, JEGS Toe Plates are easy to use by just propping one up against each front tire and then measuring. Slots at the edge of the toe plates hold your tape measure in place. 81680 - JEGS Toe Plates is rated 3.8 out of 5 by 5. Rated 5 out of 5 by Jeff53 from Great kit! I bought this kit just a few weeks ago, and have used it four times. Easy to use and understand. Rated 5 out of 5 by aj52 from Simple, well-made, and easy to use I tried a home-made solution to adjust the alignment on my son's MG. It was frustrating, I wasted a lot of time, and worst of all, I couldn't get reliable/repeatable results. I bought the Jegs toe plates and had the job done in about 15 minutes, including rechecking my work. These are simple plates, very solid and easy to use. Use them once and they've paid for themselves. Rated 4 out of 5 by JasonCR from Worked good. My '69 Ford is a twin I-beam truck, so the only thing to adjust is toe. I ordered these plates and they worked fine for me. They would have worked a little better if they were three or four inches longer, but they still worked ok. Rated 4 out of 5 by Jon M from Minor flaw, great value The slot in the toe plate wasn't wide enough to fit the curved metal piece at the end of the tape measure. Grindy grindy here and there, smashed the end of the tapes in a vise, and 10 minutes later these worked great. Rated 1 out of 5 by 86driver from Tape slots too narrow to fit tapes, not flat These were given to me as a gift. Looked fine when I first took them out of the box, but when I tried to actually use them to do a toe adjustment, I noticed 2 big problems. 1) The slots to insert the tape measures were so narrow the tape end (hook) would not fit. This was with the tape measures that came with the kit and both tape measures I own. 2) The larger problem - both plates were curved/bent slightly such that there was about 3/32" from one side to the other. The box was in very good shape and there was no apparent shipping damage - I suspect the machine that adds the bevels to the top/bottom created this curve. Hard to set your toe to within 1/16" when the toe plates are some part of 3/16" out depending on how you place them. 2 images attached - one is of the tapes provided not fitting in the slots, and the other is the 2 toe plates put together front to front. If they were straight there would be no gap in the center of the plates. I ended up purchasing a different brand - they have a 90deg bend at the top and a large 45 deg bend at the bottom. Tape measure hooks fit and they are completely flat. 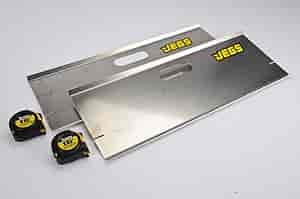 JEGS 81680K - Caster Camber Gauge & Toe Plates Kit Plates Measure 24" x 9" x 0.120"
JEGS 81680K1 - Camber Gauge & Toe Plates Kit Plates Measure 24" x 9" x 0.120"